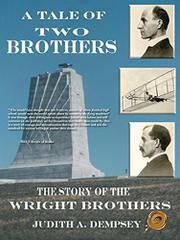 An offbeat account of the lives of Orville and Wilbur Wright, the first men to achieve flight. The story of the Wright brothers’ engineering triumph is a familiar one that many authors have covered from many different angles. But debut author Dempsey attempts to stake out new historical ground by offering an account of their family’s support, their intellectual influences, and their emotional struggles. She tells of how, at an early age, both Wright brothers displayed intellectual precociousness and how their parents encouraged them. Their father, Milton, was a minister and an enthusiastic bibliophile, and Susan, their mother, was college-educated, a rarity for women in the late 1800s. Since Milton traveled frequently for church business, Susan largely ran the household, and her bond with the boys was strong; her death from tuberculosis in 1889 was devastating to them. Dempsey points out that they also had a close relationship with their sister, Katharine, who postponed a semester at Ohio’s Oberlin College to nurse Orville back to health when he suffered a bout of typhoid fever. Although the brothers were always busily employed, either with their printing business, their bicycle shop, or their obsession with inventing the first true airplane, they were still deeply involved in family affairs, the author says; for example, Wilbur even helped his father navigate some intramural church controversies. Dempsey unquestionably traverses some well-trodden ground in this biography when dealing with the brothers’ trial-and-error inventing as well as their dogged defense of patents in the aftermath of success. But her most valuable contribution to the already inexhaustible literature on the Wrights is how she manages to effectively capture the personal, day-to-day context of their ceaseless labors as well as their undying friendship with each other. Also, she effectively reveals how Katharine was truly a central figure in their lives as well as a fascinating person in her own right—she was both a teacher and an active participant in the women’s rights movement. A sensitive portrayal of a side of the Wright brothers that’s too often neglected.